Barkingside 21 : On Yer Marks…. 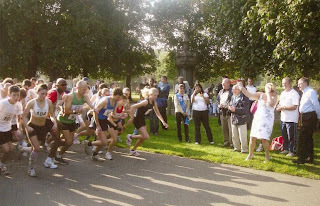 Said Redbridge Mayor, Councillor Mrs Loraine Sladden, as she pressed the button on a hand held claxon to start first the sponsored competitive run, and second the sponsored walk, in aid of 10 charities yesterday, Sunday 28th September at the event organised by the Cardinal Heenan Centre and Ilford Athletics club. As you can see the weather was just right [said goldilocks] and there was a huge turnout. Over 200 people took part and it is estimated that around £5,000 has been raised for these charities but the final figure is not yet known. Mike Gapes MP took part in the walk raising funds for CAFOD, but it appears that Lee Scott MP, who was in attendance, [far right (spatially, not politically) first photo] was not fit to play and did not make it to the subs bench. Perhaps he had a bruised metatarsel? Note: I note that the Redbridge Mayor’s blog has stuttered to an abrupt halt on 17th May 2008. Has she been banned from the award winning Redbridge-i too? The fact is, B21, that the Mayor's Blog between May 2007 and May 2008 was one of the many outstanding features and accomplishments of Joyce Ryan's Mayoralty. Her blog was borrrrrrrrrrrrring !! Our New Mayor is spending more time on her engagements and is reaching out to everyone ! Oh right! Mayor Ryan made 39 entries on the blog during her year. Mayor Sladden has made 62 and we are still only up to 13th July 2008. In which case maybe some attention to brevity and quality rather than quantity is in order?